The Diocese of Dumka was established by Pope John XXIII, by the Apostolic Bull "Exulted Sancta Mater Ecclesia" of August 8, 1962. The Diocese was formed by fusing together the area of the Santal Mission, till then part of Calcutta Archdiocese, and the then Prefecture Apostolic of Malda. The diocese then comprised the undivided districts of Santal Praganas (except Godda sub-division and Deoghar and Sarwan thana of Deoghar sub division) and of purnea in Bihar state, as well as the districts of Malda and West Dinajpur with Rampuhat sub-division of Birbhum district in West Bengal state. The Catholic Fathers made various attempts to establish a mission among the Santals, by far the most numerous aboriginal tribe in India. From 1826, a Capuchin, and from 1887 a Jesuit Priest ministered to the European and Anglo-Indian inhabitants of Purnea district and town, then famous for its indigo plantations, where a church was built and blessed in 1849 by Bishop Hartmann. The Catholic population was about 250. The resident priest at Purnea also visited Santal Parganas district to offer Mass in the Railway colonies at Sahibganj, Rampurhat and Nalhati and at Dumka, the district headquarters. A Belgian Jesuit made two exploratory tours to Santal Parganas district to offer Mass in the Railway colonies at Sahibganj, Rampurhat and Nalhati and at Dumka, the district headquarters. A Belgian Jesuit made two exploratory tours to Santal Parganas district in 1879 and 1887. The Jesuit Fathers from Asansol visited the Catholic families along the Chord Railway line and in 1908 a Church was built at Madhupur in the south-western part of Santal Parganas district. The real history of the Santal Mission began in 1924. At the invitation of their Fr General the Jesuits of the Sicilian province, then including the Island of Malta, arrived in Calcutta to help their Belgian confreres and take up the evangelization of the Santal tribe. The following year the first Churh work station was opened for the Santals centered around the village of Majlispur (now part of Raiganj Diocese), some miles north east of Purnea town. The evangelization of Santal Parganas district, where the majority of Santals resided began in January, 1930, with the arrival of Fr Benjamin Cauchi, sj, from Majlispur. With the regular arrival of fathers from Malta and Sicily, parishes were established and schools were opened. In August, 1962 when Dumka diocese was formed the Catholics in Purnea district had risen to 5,295, while the Catholics in Santal Parganas district had, since 1930, increased to 19,676. The credit for this wonderful development goes to the Archbishop of Calcutta Dr F. Perier sj who gave generous help to the Fathers to establish the Church in Santal Parganas district. The Foreign Missionaries of Milan (PIME) developed Malda Prefecture and at the time of its integration with Dumka Diocese there were 6,065 Catholics. 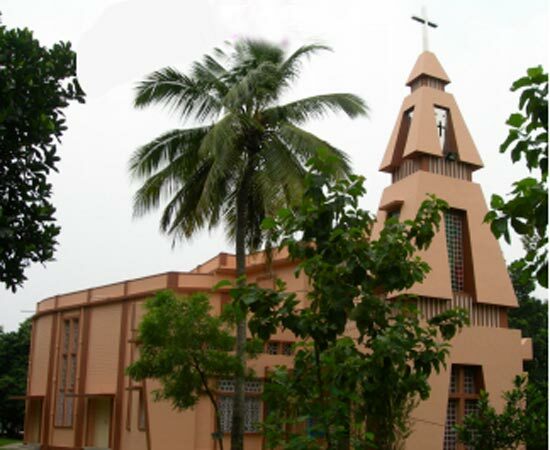 On November 10, 1978 the new Diocese of Raiganj was established, detaching from Dumka diocese the two civil districts of West Dinajpur and Malda in West Bengal State. Bishop Leo Tigga, sj, the First Bishop of Dumka, was transferred to Raiganj as the First Bishop of the new diocese. In 1974 the districts of Purnea was bifurcated to create the new district of Katihar. In January 1990 Purnea district was further divided and the new district of Araria and Kishanganj were formed and Purnea became the Divisional Headquarters. The former district of santal Parganas was elevated into a Division in May, 1983 and was divided into four districts, namely Dumka, Deoghar, Godda and Sahibganj. Sahibganj district was divided into two in 1995, namely Sahibganj and Pakur. Of these, Dumka, Sahibganj and Pakur districts and Madhupur sub-division of Deoghar district form part of Dumka diocese. Thus today Dumka diocese comprises the civil districts of Dimka, Dahibganj, Pakur, Deoghar (Part), Purnea, Katihar, Araria and Kishanganj in Bihar, Rampurhat sub-division of Birbhum district in West Bengal.